Home Business What next for bi-mode trains? Train technology is advancing rapidly. However back in 2009 our industry was in a very different place. That year, as part of London’s preparation for the Olympic Games, we were finalising Hitachi’s delivery of the Class 395 ‘Javelin’. It is an iconic fleet and one which reignited the industry’s desire to be creative once more when it comes to designing new trains. In that same year, I was given the biggest challenge of my career so far. Hitachi was supporting the Department for Transport’s plans to bring new high-speed trains for main line routes. Crucially, these trains would need to run on both electric and diesel power, be Digital Railway ready and have ultra-low emission compliant engines. It had never been done before, and some were sceptical we could achieve it. Fast forward to 2018, and we have our first wave of intercity bi-mode trains carrying passengers on the Great Western main line. The trains have already clocked up over one million miles in passenger service, providing 500,000 extra seats between London and Wales. Best of all, we delivered these modern trains whilst electrification works and station upgrades took place; meaning passengers did not have to wait. 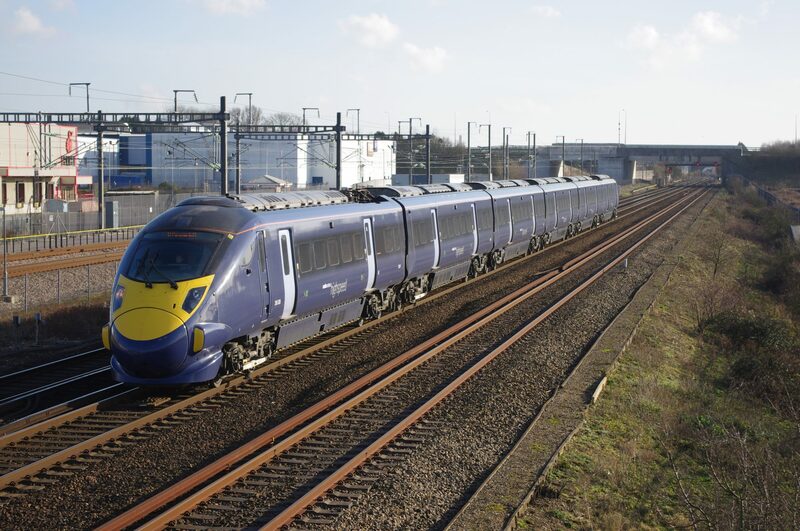 Hitachi is now building 182 intercity trains, mostly bi-mode, set to run along main line routes including the North Pennines, Scottish Highlands and as far south as Penzance. Thanks to our bi-mode innovation, operators do not have to wait to improve their services. Years ahead of schedule, we’re seeing new destinations unlocked, journey times cut and capacity increased on busy routes. The train is now becoming the new workhorse of intercity travel, and it’s great to see our factory in the North East of England building almost one a week now. This is a significant achievement for the industry but we’re not resting on our laurels by any means. I have always lived by the Japanese philosophy of “Kaizen”, meaning good enough is never good enough. Our sector is moving quickly, and the demands of routes and operators constantly change as new investment comes in. That is why we are looking at the next innovation for the intercity trains. A Class 395 ‘Javelin’. Photo: Joshua Brown. When we designed our intercity trains we made them modular, allowing us to easily make modifications. My inspiration for this was the HST, a train which is entering its 40th year of service and remains much admired by passengers. I want my intercity trains to last as long, and the design reflects this. For example, we can remove diesel engines if lines become electrified, making the trains purely electric. We can also add new fuel sources should the train need to run on new routes without electrification. This way, regardless of the destination and infrastructure, passengers can enjoy new trains. Modular also means we can make changes to interiors to ensure it meets the needs of the route. Whether the operator wants a high density train or one with large catering carriages, we can personalise it for passenger demands. Arguably the biggest development for our intercity trains will be seen over the coming years as we focus on alternative power sources. Earlier this year, the rail minister set out his ambition to remove all diesel-only trains from UK tracks by 2040 in a bid to cut carbon emissions. In the announcement, bi-mode was cited as a bridging technology. Thanks to our modern Rolls-Royce MTU engines, we are able to cut harmful emissions (PN20) by up to 90 per cent compared to the trains we are replacing. Of course, our train will use electric power wherever possible, drastically cutting emissions too. Yet the big question remains, what next? To continue the minister’s metaphor, do we cross the bridge and cut down emissions even further? Hitachi has been researching this for years, and draws on expertise from its operations and expertise all around the world. Firstly, there is battery technology. 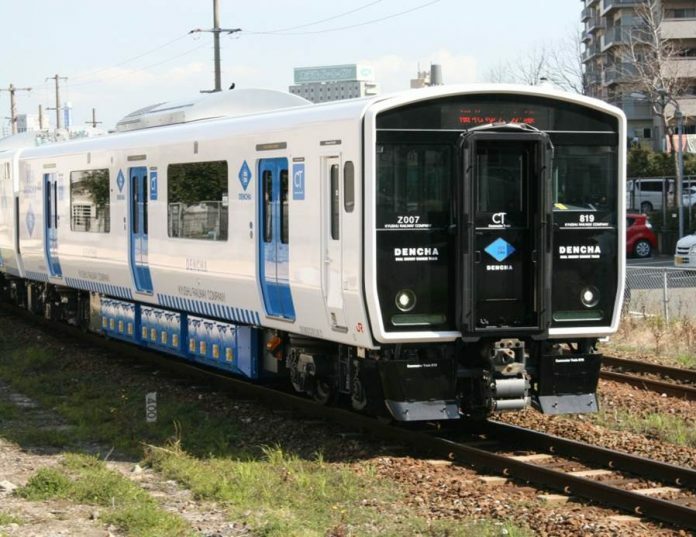 In Japan, we already have a pure battery main line train in passenger service. The DENCHA train runs using battery power on stretches of track not electrified, and needs charging after approximately 40km. The battery powerpacks are fitted underneath the train, much like our diesel engines on British intercity trains. The motor industry is making great strides forward when it comes to improving the range and performance of battery technology. This is why my colleagues at Hitachi Automotive Systems have teamed up with car giant Honda to produce all electric vehicles for both rail and road. Where the motor industry has taken the lead is the hybrid model. By using a battery alongside diesel engines, we can see performance levels increase whilst emissions drop. Hitachi proved this is possible by carrying out tests in the UK. In 2007, we applied this battery hybrid technology to a HST. Jointly with Network Rail and Porterbrook, this became the first of its kind to ever run in Europe. The results were that fuel consumption decreased by 20 per cent as a result of the battery technology. It is fair to assume with advances in battery capability, this figure can come down even further. There has never been a more exciting time to be a rail engineer. Never before has there been such a sense of ambition and collaboration to make this country a world leader in rail technology. Whether it’s my work with the University of Birmingham, Angel Trains and also UK company Fuel Cell Systems on fuel cell technology, or overseeing the first wave of bi-mode trains into passenger service, every day brings me new challenges. I keep telling my team of engineers to think big and be bold. The reward will be building trains the world has never seen before, and for an engineer, there is nothing more fulfilling that that. Hitachi could also plan to build new London Underground tube stocks for the Central, Waterloo & City, Piccadilly and Bakerloo Lines (which Bombardier, CAF, Siemens, Alstom etc are also planning ahead to build new tube stocks from the 2020’s+). The introduction of the new IEP trains on Great Western has not been as successful as Mr Agatsuma suggests. The new trains have been plagued by teething problems including a reservation system which still does not work. The seats and ride quality are also much poorer than those found on the 40 year old HSTs which they are replacing. Delays in the arrival of nine car sets means GWR is having to run five-car sets in pairs which passengers find very confusing and doubles the number of on-board staff required to operate them.